Taken with Olympus E500 digital camera May 3rd 2007. Click image for larger view. 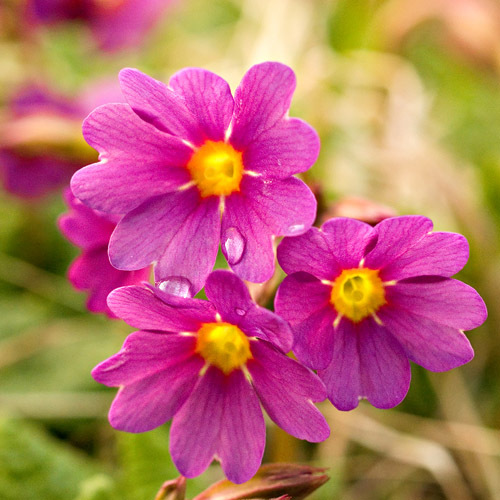 The Primula got it’s name from the Latin word Primus that means “the first one”. It got it’s name because it is one of the first flowers to blossom in the spring. The flowers are native to the temperate Northern Hemisphere, south into high altitude tropical mountains in Ethiopia, Indonesia and New Guinea, and are also found in temperate southern South America. There are amazingly 400-500 species of Primula and some of species are called primrose, auricula, cowslip and oxlip. I have just seen a handful, but there are some really nice color combinations out there. Wow, I love the bright colors in this one. Very nice! Found you on wuzzle, btw. Beautiful flowers, my Grandma used to love primulas, and then again, she loved most flowers. I am really enjoying your photography, thank you for sharing it! En nydelig blomst. Men det ser ut som om den grÃ¥ter. Trist fordi vÃ¥ren er sÃ¥ langt borte?? ?